I love peace and quiet, so that’s exactly what I choose when I go on vacation. 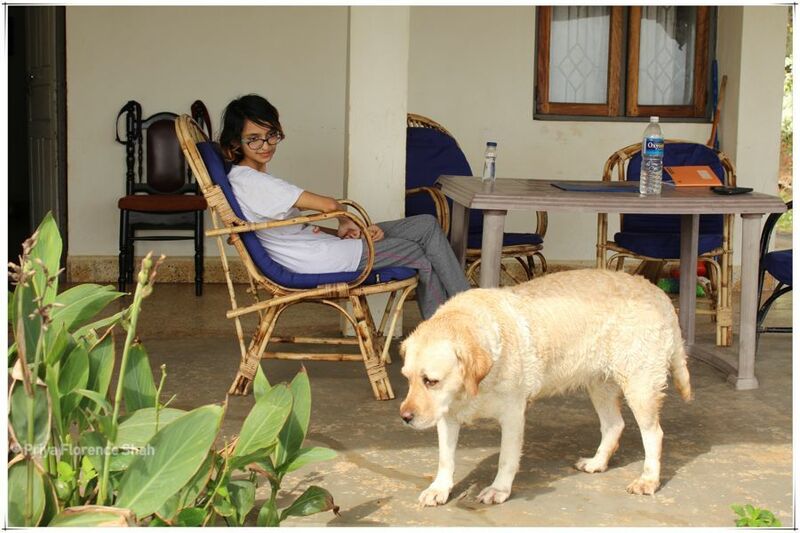 This time I wanted to take my dogs with me too, instead of leaving them in a pet hostel in Pune. 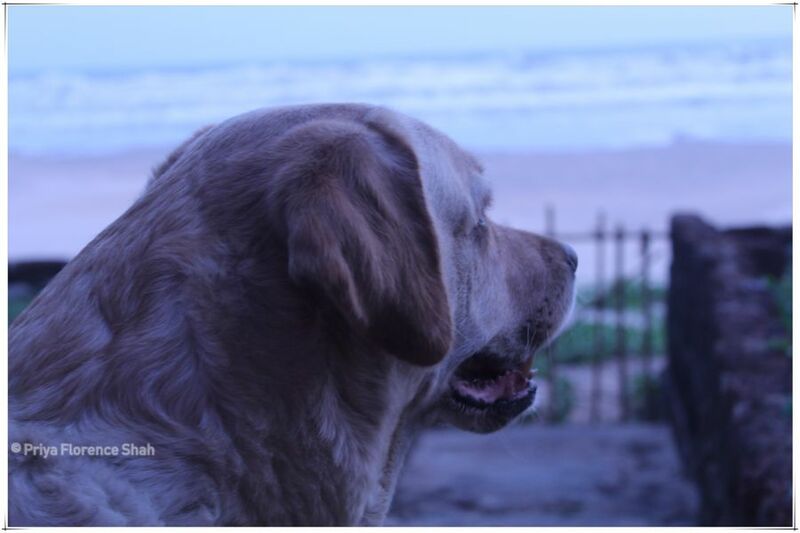 The last time I went on a road trip with my dogs was to Murud beach in Dapoli. That was a trial to see how well they took the road journey, which was a long 7 to 8 hours. 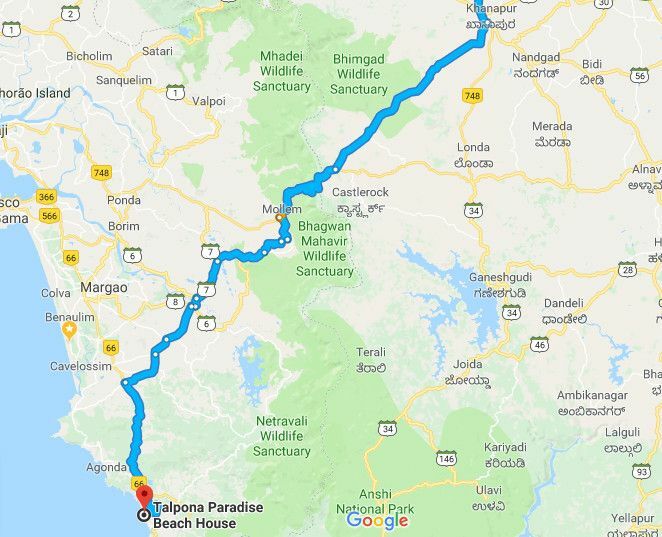 Since they seemed to enjoy it, I decided that our next road trip would be to Goa, around 12 hours away. 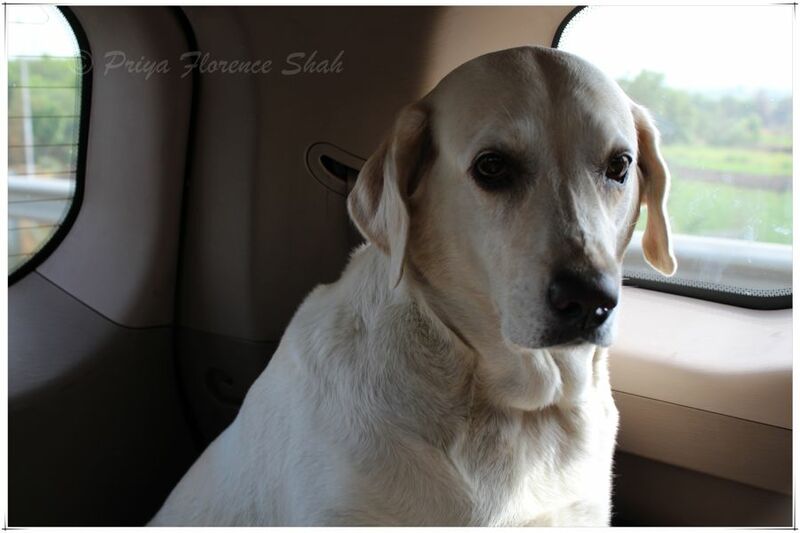 To complicate matters, a few weeks before our trip, my 8-year old lab, Tiara, was diagnosed with urinary bladder stones and had to undergo surgery to remove them. Luckily, she recovered from her surgery faster than I did. To plan the perfect summer beach vacation with our dogs, I turned to my favourite hotel search engine, Booking.com, because they allow you to filter your choices so you can see only the pet-friendly stays. 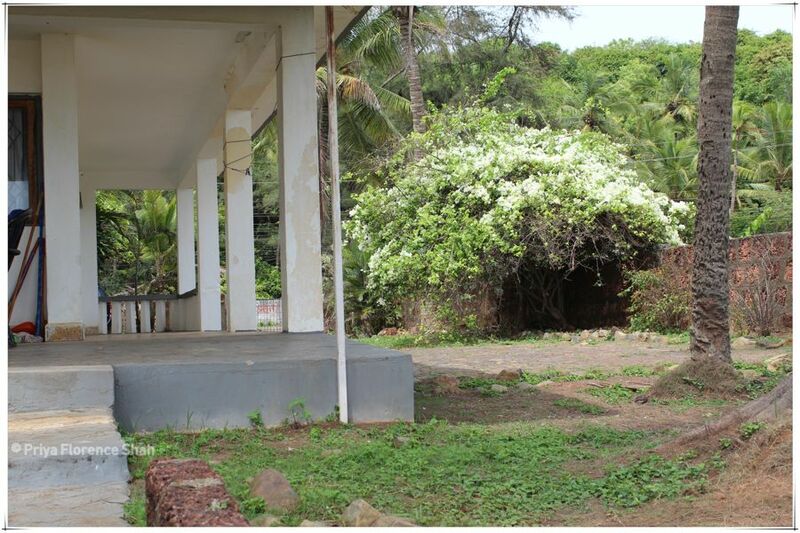 I first booked a place at Agonda, one of my favourite beaches in Goa. Then, I realised we’d be travelling with my brother, and the driver too. So, beach resorts wouldn’t work for us. 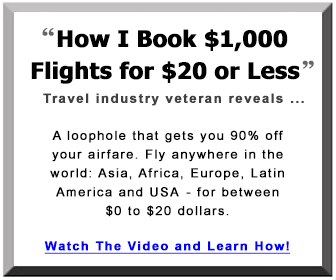 Hmm, cancel the booking. 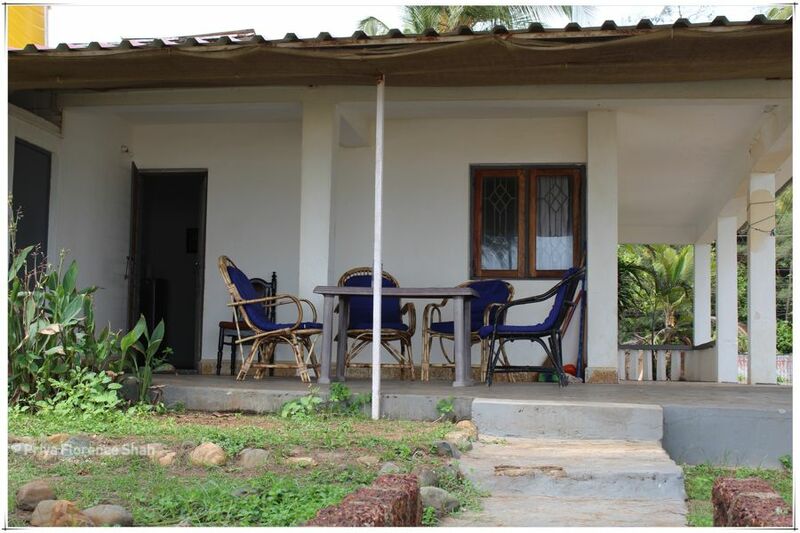 I looked again for family rooms or cottages on beaches nearby and found a cottage intriguingly called Talpona Paradise Beach House, at Talpona Beach in Canacona. So I made the booking and contacted the owner. After some back and forth, he offered me the cottage with air-conditioning for the same price. 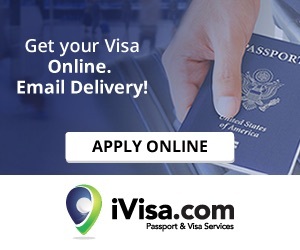 Available for a week? Check. Having booked our cottage months in advance, we set out at around 7 am on the 19th of May, 2018. We had packed everything we could think of – dog food, bowls, drinking water, a whole bag of food and snacks for us (because we had no idea what to expect). We picked up my brother and I opened up Google Maps. It showed us a route that completely bypassed Mapusa and Panjim, going instead via Belgaum and Molem sanctuary. The route was also much shorter (9 hours) than I expected (12 hours). The dogs and we settled in for our long road journey. The road to Belgaum (or Belgavi, as it is now known, thanks to our frustrating tendency to never be happy with the way things are) was pretty straightforward. A highway with two one-way lanes. Once we crossed Belgaum, things got interesting. The long and winding road now led through lush, green forests and wildlife sanctuaries, such as Bhimgad Wildlife Sanctuary, Kali Tiger Reserve, Castlerock Wildlife Range, and Mollem Wildlife Sanctuary. The drive through these woods was quite a treat, with green, verdant foliage all around us. When we were on the ghats (hills) the road weaved and turned in hairpin bends until our stomachs lurched and the dogs woke up from their deep slumber. I was thrilled with Google Maps for leading us through a route that was so scenic, beautiful, and most of all, almost free of traffic. 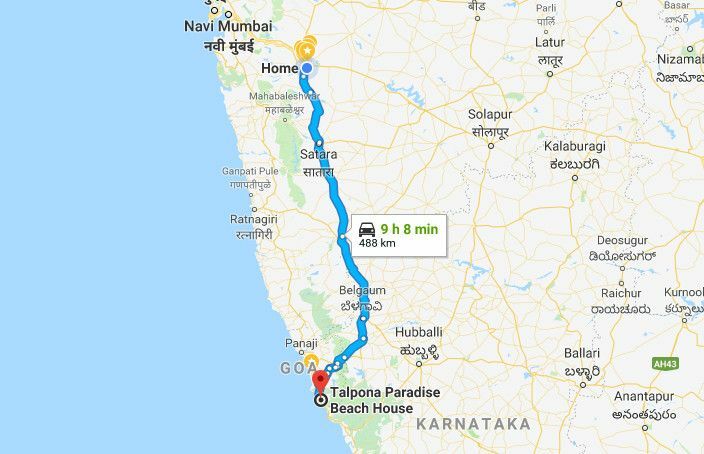 We made good time, despite two pit-stops, and reached the beach house by 5.30 in the evening, around 10.5 hours after we left Pune. The house itself was very comfortable. I wanted peace and quiet, and I got it in spades. Talpona is a small village that has little but a small grocery store and a couple of restaurants that serve (the almost non-existent) tourists. To actually buy anything you need, you have to drive to Canacona market, about 15 minutes away. The air-conditioner was in the living room, but it cooled the entire house. The owner gave us the number of the caretaker, a sweet girl called Prasanna, who greeted us when we arrived. He also gave us the number of Deepak, who ran a restaurant nearby. Deepak’s wife makes a mean crab curry, with the result that I pigged out on the stuff till I had crab coming out of my ears. The rest of the seafood was delicious too. The Wifi started out excellent, then failed a couple of days before we left. Deepak’s 15-year old son, Shantanu, installed a Jio router for us, but it was extremely slow. Other than those few hiccups, the place was perfect. There was a pack or two of stray dogs, but we managed to intimidate them into staying away while we took our dogs swimming every day. Being Labs, both our dogs love water and enjoyed their swims thoroughly. The sand and the waters were clean and free of garbage, thanks to the conscientious villagers. However there’s a strong undercurrent that can pull you into the water if you’re not careful, and there are rocks under the waves in some parts, so swimming is not as safe here as it would be at, say, Baga beach. Spending a whole week here was heavenly. 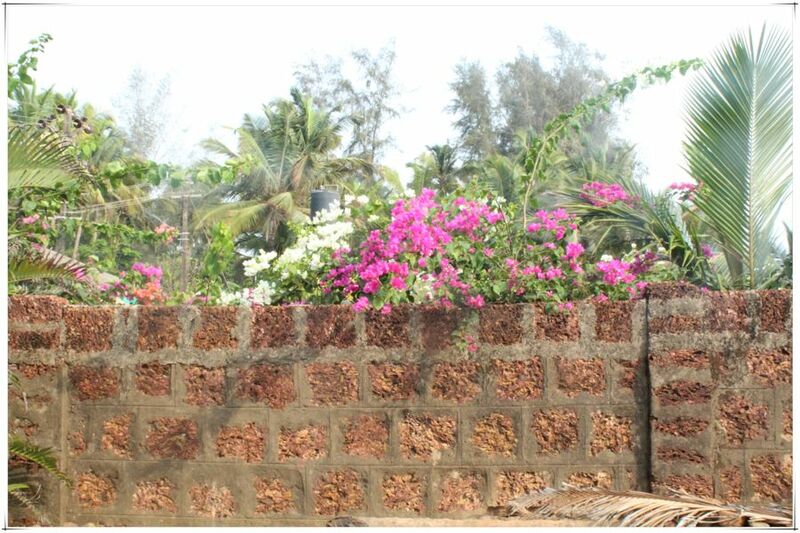 A lot of the time I would just sit and look at the waves or watch lizards sun themselves lazily, heads bobbing on the porous laterite walls. Eagles circled the cliffs nearby, while a murder of crows cawed and teased my dogs, and mynah birds cooed in the trees. Butterflies floated past in a daze. Blades of grass eagerly pushed out of a bed of dry needles from the two casuarinas in the small garden. 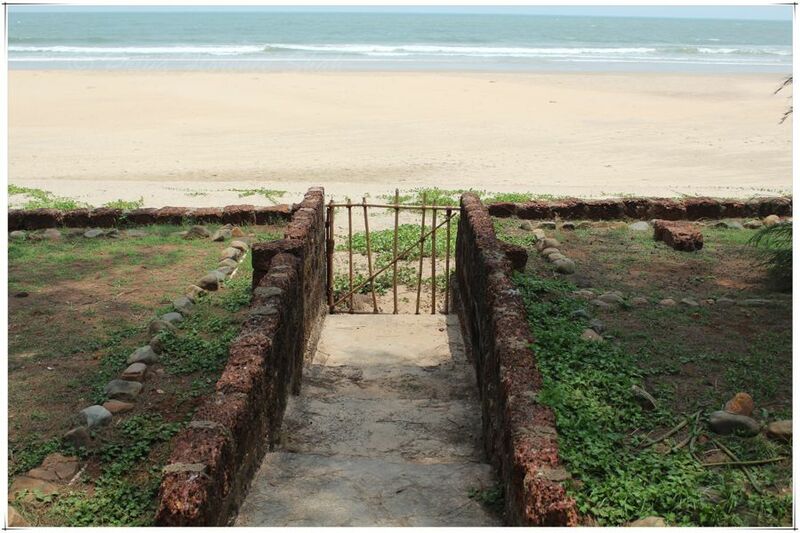 A row of steps led to the sea, while a flimsy gate of thin bamboo sticks strung together kept out cows and people. We ate our meals looking out at the waves, sitting in cane chairs with blue cushions around a grey plastic table, in what passed for a balcony. A large white bougainvillaea growing in the garden reminded me of the Singing Bush from The Three Amigos. I noticed that the sun would set not in the middle of the horizon like it did at Agonda, but in the north-west. I guess we were much further south than I thought. The route to the beach house is just as scenic. 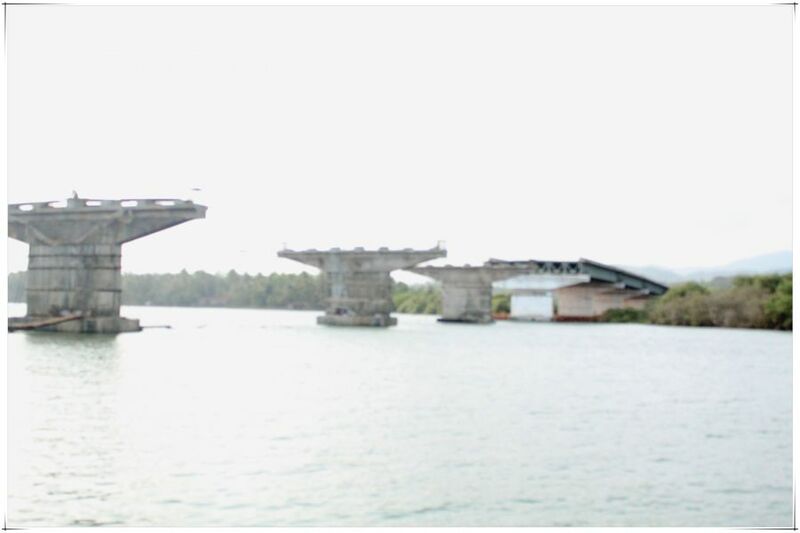 A river meanders down through patches of mangroves, while pillars of a half-finished bridge stand in the river just ahead of a mangrove forest, like lovelorn lovers waiting to be united. Thick mangroves line the river all the way to the sea. In a little bay at the mouth of the river, behind a spit of sand, sits the Rio de Talpona Guest House with an enviable view of the river and ocean. Small houses built with locally-sourced laterite stone line the roads, sometimes painted in garish colours. My child and I also went on an excursion to the nearby Galgibag beach, a nesting point for turtles. I woke up a man called Samir, one of the guards who was supposed to be keeping an eye on the new nesting site cordoned off with nets (to prevent stray dogs from digging up and eating the turtle eggs). He told me the forest officer sits at Cotigao Wildlife Sanctuary while forest guards watch the nesting sites in shifts. 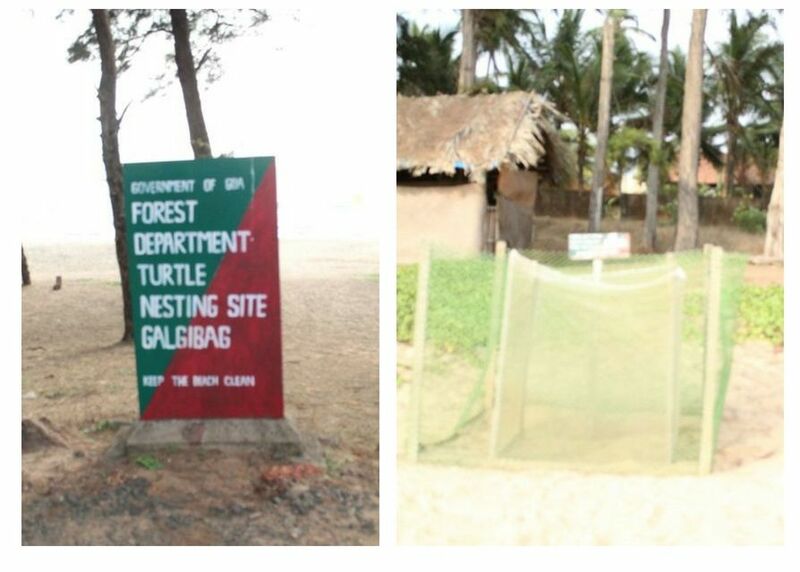 However, turtles have been decreasing at Galgibag, while more come in at the Agonda nesting site. 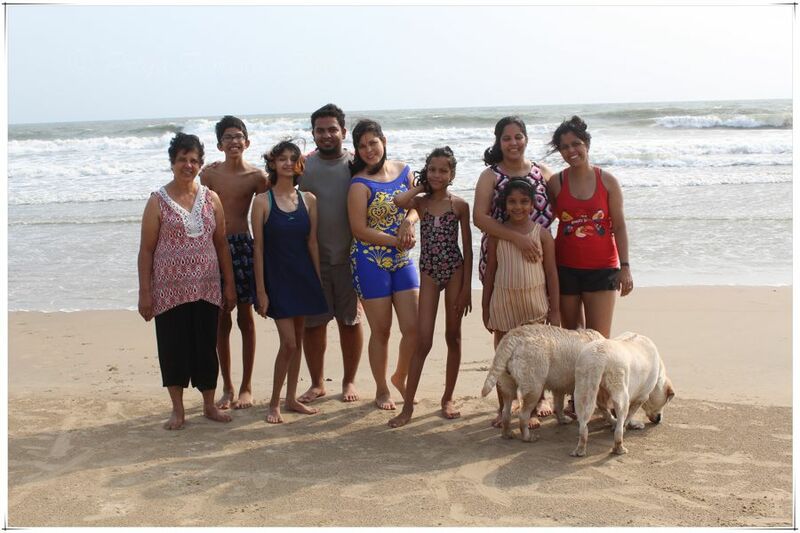 Two days before we left, to our delight, my aunt and cousins from Panjim dropped in and spent the day with us. They loved the house and the beach and decide they would come again sometime for a picnic. All of them being ardent dog-lovers, my dogs were thrilled with all the extra attention they were getting. 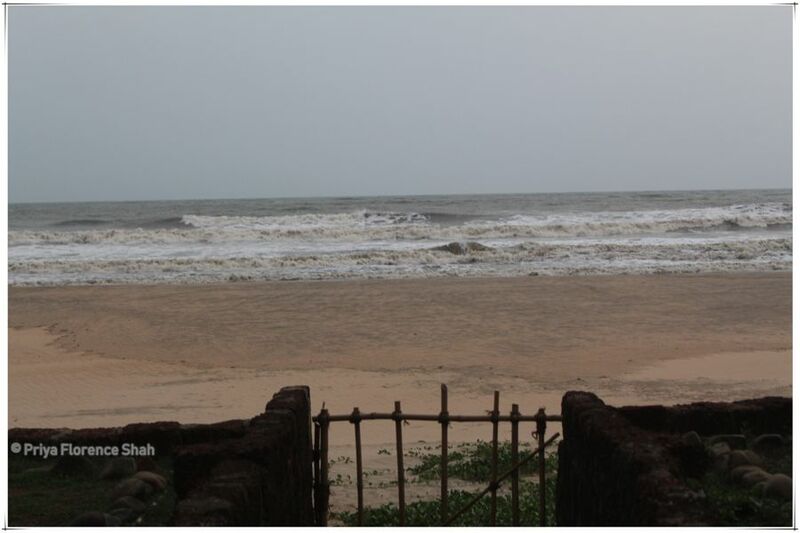 On the last day of our vacation, we experienced the highest tide, probably because of the onset of the monsoons. The seas may have been choppy, but the sunset was sublime. Even Chewie agreed. As we were leaving, I gave Prasanna, the caretaker, a generous tip, and told her we’d be coming back every year with our dogs. I really meant it. As we passed through all the wildlife sanctuaries on the way back, I stayed alert and even managed to spot a peacock running into the forest. Thank you, Google, for taking us through such a lovely route. However, I do have a wishlist for you. It would be nice if Google Maps gave us advance notifications of fun things to see and do along our route, and also if we were offered a choice of the faster or the more scenic route. Imagine how much more fun our road trips would be! 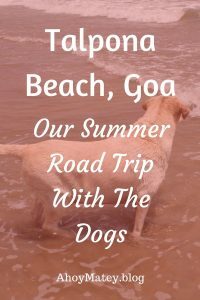 In the summer of 2018, we went on a road trip with the family and our dogs to Talpona Beach, Goa. This is how we enjoyed the rustic life. So timely Priya. Last night I watched the Bourne Supremacy. 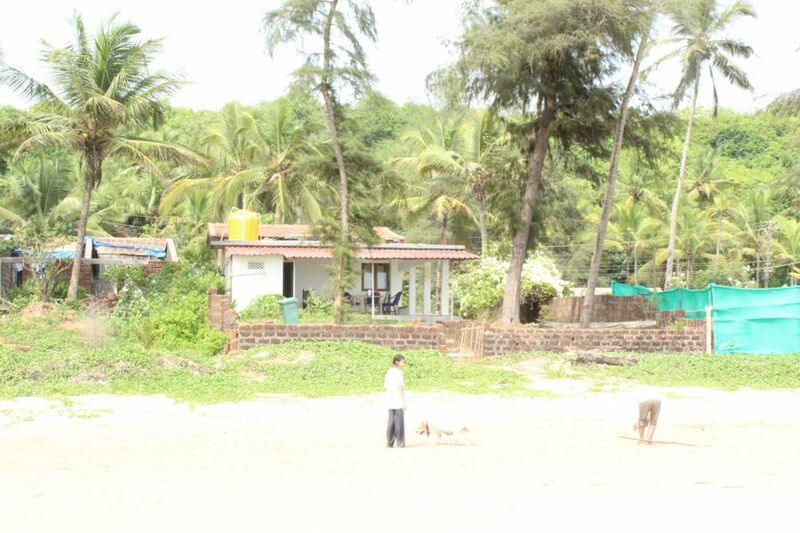 Matt Damon’s character opens the movie living in Goa, running on the beach. 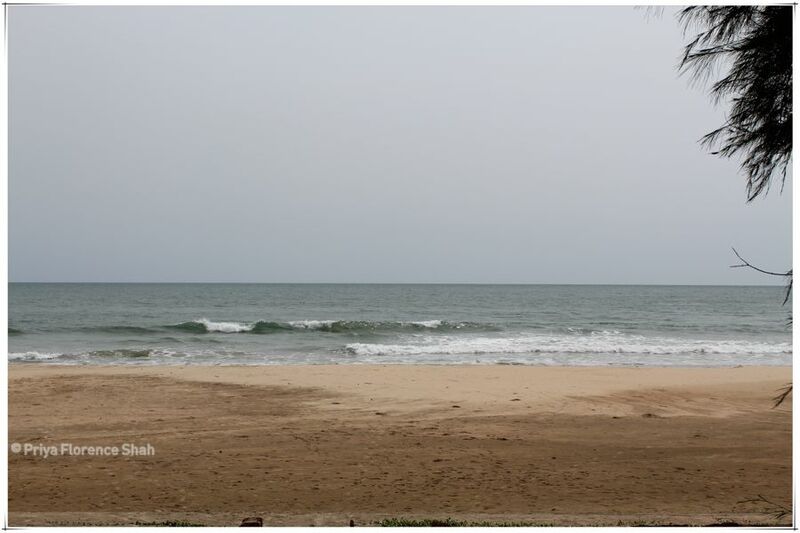 Your post and the flick brings me back to my Kovalam Beach days. 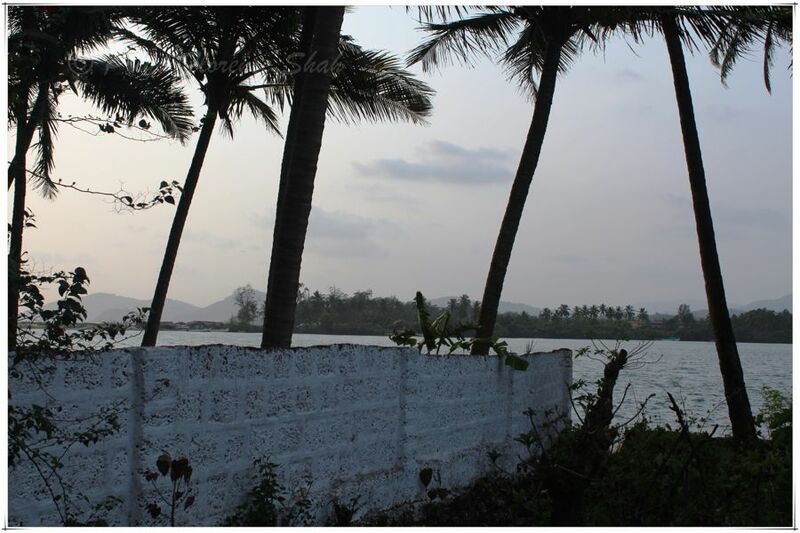 Beaches in India have that special feel; fisherman boats, lovely palm trees, craggy outcroppings. Wow, Ryan. I love that movie and I loved when it opened up in Goa. So cool. Beaches in India do have a unique culture. Thanks, Kristie. My Tiara is a bit old and has health issues too. But I want her to live a full life, and love taking them to the beach. They enjoy it so much. Wow Priya, what a lovely place to spend time with family. 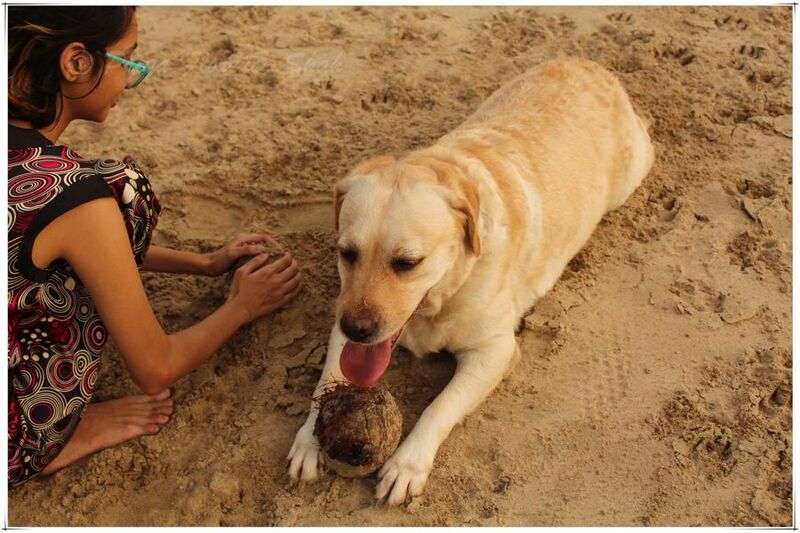 The dog seemed to have enjoyed so much in Goa. 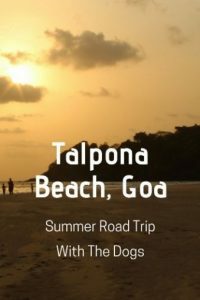 I have never heard of Taplona beach before though I have been to Goa multiple times. Thanks to you, now I know. Great share! It was a new place for me too, Shreya, and I’m glad I went there. Yes, I love peace and quiet on a vacation. My pupper would have LOVED a trip like this! Anywhere where she can run around, sniff things, and get into water is the best for my dog. I bet your pups felt spoiled. I never realized how much work it would be to take your pets on vacation with you! Glad to know that there are options for pet accommodations. Looks like you had a great vacation and your pups too. 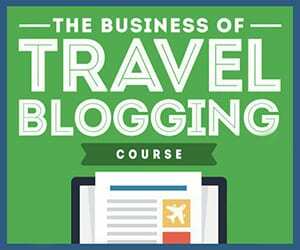 Yes, it involves almost as much planning as when taking kids on vacation. Yes, it was really peaceful and calm. I love the beaches where you can go with your dog and nobody is looking at you, because if there is a lot of people I always get a strange look. 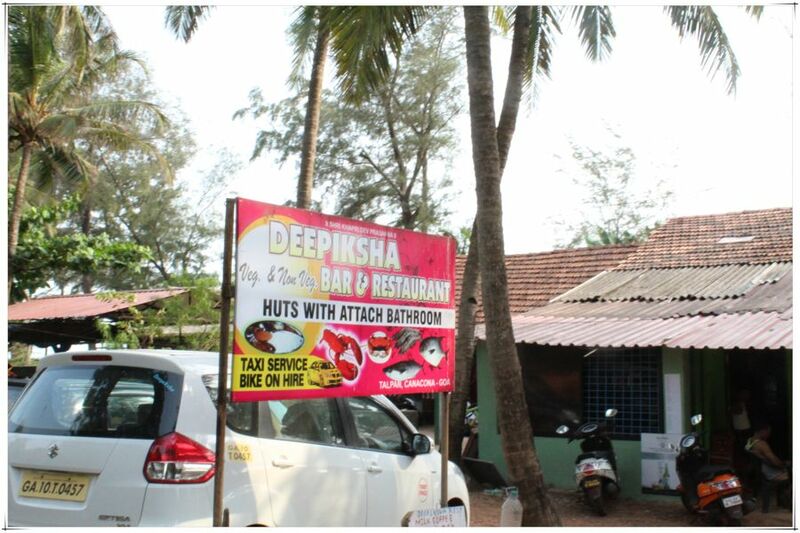 Goa is fun for parties, but those mostly happen in North Goa, which I avoid. I need my peace and quiet on vacation. 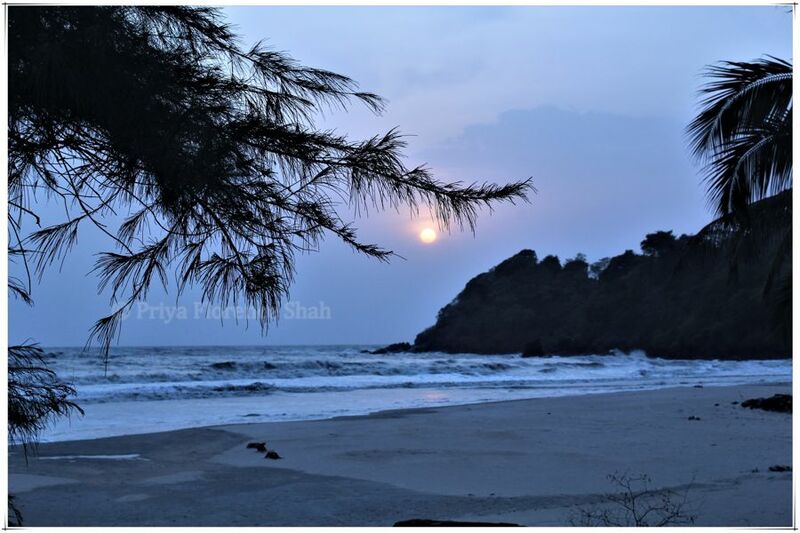 Goa is so versatile and has so much to offer, Prya. I went there last year and it won my heart. I haven’t been to Talpona beach but it seems like a perfect holiday please, especially when in the quest for peace and quiet! Talpona was a first for me too, Lydia. It was a lovely discovery. I plan to make it an annual holiday for me and my family. I’ve never been to India, but Goa looks like somewhere I’d enjoy. I loved reading about this Talpona Beach, but honestly I was distracted by your gorgeous dogs! Chewie and Tiara are wonderful, I love labs, would love one myself one day! 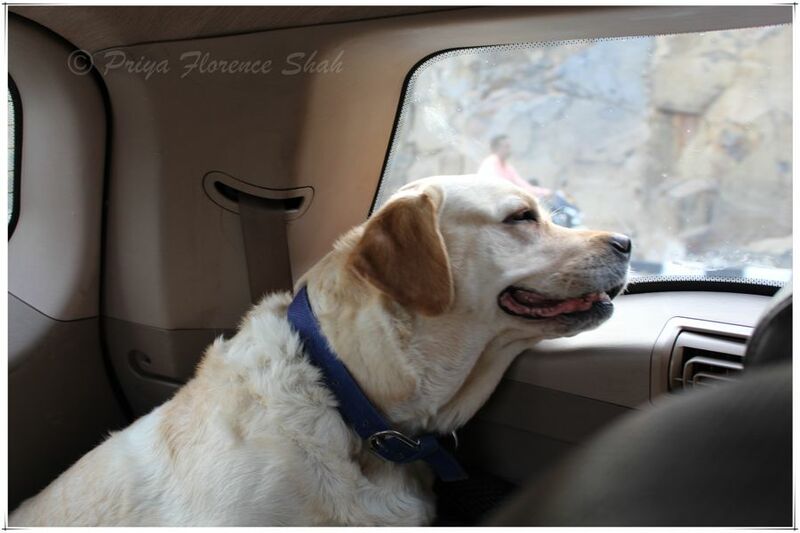 I do adore them and the hardest part of travel is leaving my dogs behind, that’s why I loved taking them on this road trip. I hope you get to see Goa sometime. I don’t think anyone could get bored in Goa. 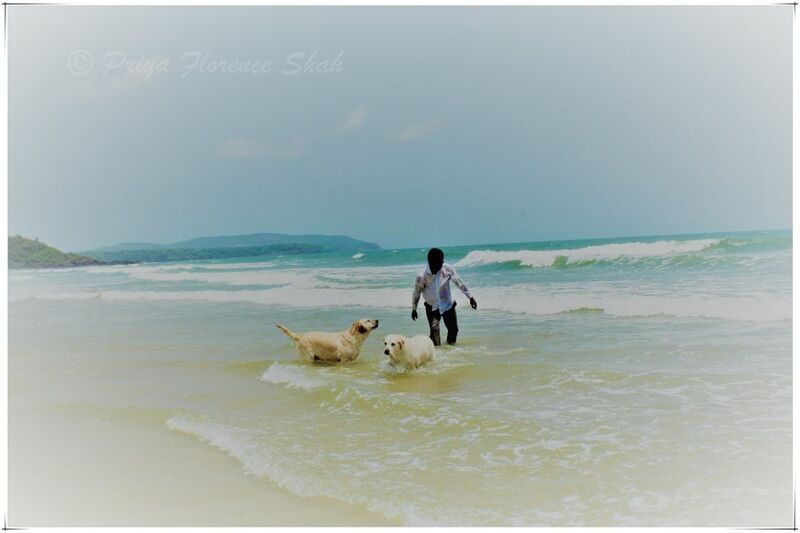 There are always beaches to see and enjoy, made more fun with dogs. They’re very sweet dogs, Chris. Chewie is a little boisterous, but we had a great time with them. Looks like you enjoyed your time with your family. Goa looks like a wonderful peaceful getaway destination. Goa can be loud as well, but this little village was a gem we found because I was looking for something away from the madness. Your pups are so incredibly precious! I already love them so much. How did you make sure they were comfortable in the car? Are they used to traveling around in a vehicle? I took one of their mattresses with us to make them comfortable. They had enough place to sleep and walk around on in the back. And yes, they’re used to travelling in a vehicle. Wow, it was a lovely vacation for you and tiara. She seems enjoying the whole trip. Glad you didn’t had a difficulty on finding a pet-friendly accommodation. Hotels and resorts should add this services, coz pets are family. Thankfully, the number of pet-friendly accommodations in India has increased so it’s no longer as hard as it was many years ago.